Note: Before I get into the details of how we use the Gaia app, I want to make it clear that I am just a happy customer. Although I might sound like a salesperson, we are not being compensated in any way for this post and have paid full price for the app. In this post, I will share how we use Gaia GPS for the following activities: scouting, trip planning, and record keeping. At the end of the post, I also share some basic tips on how to get started with the app and some links for further information on more advanced features. Colorful badlands, Death Valley National Park. For this spot, we saved the parking area in our car GPS and then specific vantage points that require hiking to access in our Gaia app. This makes navigating to the right spot at sunrise quite easy. Gaia is a GPS app available for Apple and Android devices. The app helps make a device you already own - your phone - into an easy-to-use, full-featured GPS device. The app has two pricing tiers - $19.99 per year, which includes basic maps, and $39.99, which includes an expanded map selection including National Geographic Trails Illustrated maps, better coverage for Europe, and other map collections. We subscribe to the premium membership but the basic membership is more than enough to get started with Gaia. Because I am so enthusiastic about using Gaia GPS, I often talk about the app with other photographers and always hear the same concern: I don’t have cell service in most places I will want to use the app. Unlike previous versions of phone GPS apps, Gaia GPS will work on newer phones even when you do not have a cell phone signal. So, as long as you have a phone with a GPS that works without cell service, the Gaia app should work for you especially if you take the time to download any maps you need before you head out of cell service. 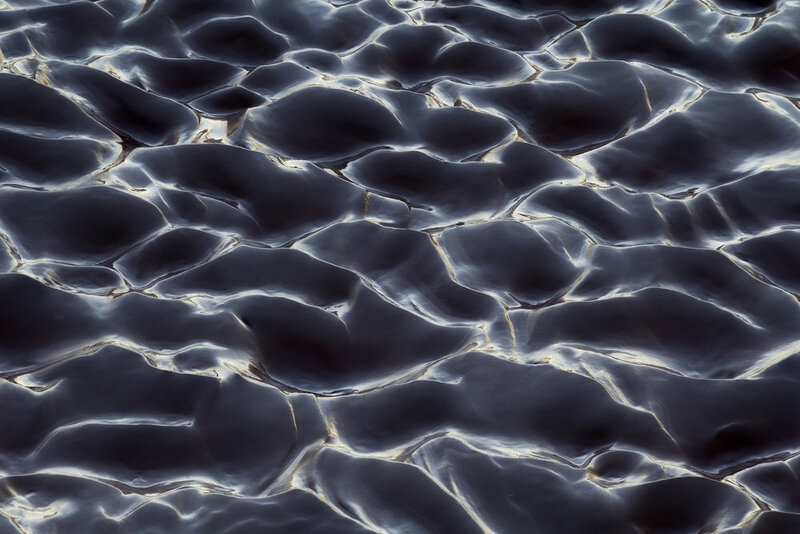 Ripples in wet sand, Death Valley National Park. Why use Gaia instead of a dedicated GPS? Accuracy: Gaia is equally accurate to our expensive handheld GPS units and the tracking seems better in enclosed places, like canyons. Ease of Use: Gaia is much easier to use. With a large, color screen on my phone, maps are easier to read, the app is easy to navigate, and saving tracks and photos is super-simple. My old GPS has a camera and it took about 3 minutes to take and save a photo if I wanted to add a title. Using the Gaia app, the same task takes about 10 seconds. Typing on the phone screen is so much easier than a GPS unit because the touch screen on a phone is bigger and more responsive. This makes it easier to add a more descriptive title and notes, making the GPS much more useful for scouting and record-keeping. On my old GPS, I might label a photo as “cracks 7.” Using Gaia, I can save a title like “large geometric cracks in red mud” or “Badwater thin white polygons, best at sunrise." Always in My Pocket: Since I always have my phone with me, using Gaia is easy. I do not have to remember a separate piece of equipment, bring another set of batteries along, have another set of cables, and use special software. Cost: For what I paid for my old GPS unit, I could pay for 12.5 years of Gaia’s premium membership or 25 years of the basic membership. While my iPhone was expensive, I have already made that investment so a small annual fee for the Gaia app seems completely reasonable to me, especially considering how much we use it. Sync Between Devices: Ron and I share a Gaia account. We have the app installed on both of our phones and then sync our devices. This allows us to easily create a shared repository of information. Since we typically hike to a photo location together and then go our separate ways, one of us will record a track of our outing and then both of us can independently save waypoints and photos. When the app is synced, the data is also backed up in the cloud. 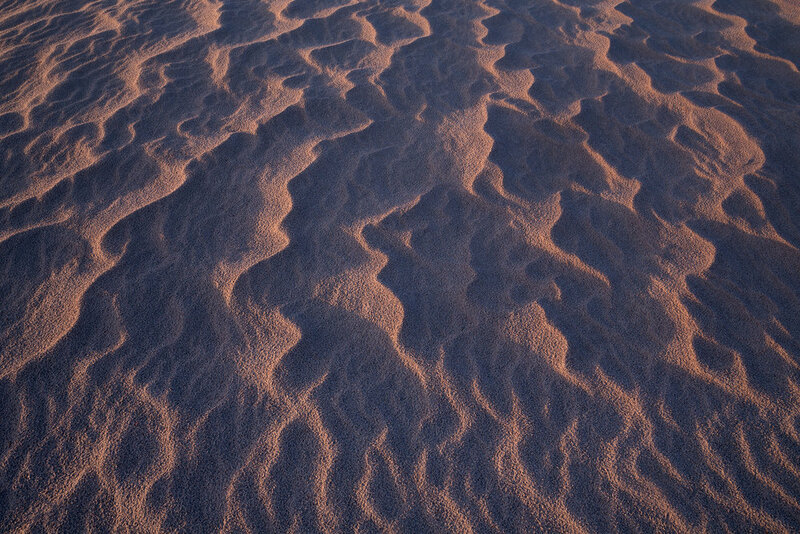 Sand patterns, Death Valley National Park. When I come across interesting things like these sand patterns, I often save a waypoint with a photo attached in Gaia. This allows me to easily return to a very specific spot in the future. We use Gaia for three main activities related to our photography: scouting, record-keeping, and planning. I go into each of these activities in more detail below. We use the Gaia app on almost all of our photo outings. Like I described above, the Gaia app is incredibly helpful for saving information about potential photo spots, documenting specific composition ideas, and navigating back to a location at a later time. Adding Waypoints and Photos: The ability to easily add waypoints and photos tagged with GPS coordinates is the app's most useful feature for photography. Whenever we go out for photography, we always record waypoints, often with photos attached, to help create a repository of information that we can use for planning and navigation in the future. During a hike, for example, we will take photos using Gaia to create a record of potential photography spots along a trail, including notes about whether the spot might be good at sunrise or sunset. Using Gaia, I also take photos of my LCD as a record of compositions that I might want to return to under different conditions in the future. Recording a Track: When recording a track, Gaia captures a full record of an outing, including the route traveled, mileage, travel time, ascent, descent, an altitude profile, average speed, moving speed, and some other data points. For photography, this information can be helpful in a few ways. For example, recording a track can help you know how long it will take to return to a spot for a future sunrise or sunset. I have also used a recorded track to re-locate a spot that I forgot to mark with a waypoint. Since I am a wanderer when I am out photographing, it is also fun at the end of the day to see how much ground I covered during a photography outing. Marking the Car: In an expansive and featureless landscape like those often found in desert environments, marking the car when departing for sunset is both practical and important for safety. Last year, we were photographing Joshua trees in fog. As the sun dipped below the horizon, the fog thickened and all navigational aids - like mountains in the distance - were fully obscured. Marking our car in Gaia helped up get back to our car safely after dark. This same practice can be helpful anytime you venture out for sunset. One of my favorite things about using Gaia is creating a repository of information about our travels. In organizing some of the folders for this post, I enjoyed looking through the many hikes we completed in the last year. Beyond serving as a trip down memory lane, all of our information saved in Gaia helps with planning a return trip to any of the places we have documented using the app. Gaia can become messy quickly if you do not commit to an organization structure early on. We organize all of our tracks, waypoints, and photos into folders. We have top-level folders like Iceland or California. Within those folders, we typically organize information by park or specific location. Our California folder, for example, includes sub-folders like Death Valley National Park, Anza-Borrego Desert State Park, Mojave National Preserve, etc. Then, we put all of the waypoints, photos, and tracks for each specific place within the sub-folder. This makes accessing information in Gaia much easier. Finally, Gaia allows users to sync all of their data to the Gaia cloud. Given how much information we have stored in our Gaia account, I like knowing that it is saved someplace other than on my phone. Gaia also allows users to import and export information for use with other devices or sharing with friends (for example, you can share information with other iPhone users via Airdrop). Unlike some photographers, we are not big planners when it comes to our photography outings. If we find a place that looks interesting, we get the basics and go. If our chosen destination includes any complicated route-finding, we may add waypoints in advance or create a route to help with navigation. In addition to adding routes or waypoints in advance of a trip or hike, our main trip planning activity includes downloading detailed maps for our destination. This helps make the app much more useful for planning and navigation. If you have a GPX file with a route or GPS coordinates (for example, shared from a friend or downloaded from a hiking website), you can easily import this information into Gaia to help plan an outing (see below for basic instructions and an example). Beyond this basic task, the Gaia GPS website provides helpful information for using the app for more advanced trip planning. The first Gaia screenshot (below right) shows how I have my home screen set up: the map, plus the record button, the photo button, distance, and ascent. All of the items in line starting with the record button can be customized based on your preferences (one item of interest for photographers: you can set one of these sections for sunrise/sunset times for your location). You will also want to make sure you download detailed maps for the locations you will be visiting, which must be done when you have a cell signal or internet access (wifi is preferable given the size of some maps). The Gaia help section offers advice on how to download and use maps, based on your level of membership. Note: these instructions are for the iPhone Gaia app. I have not used the Android version but expect the steps to be similar. Click on image to open a larger version. #1 is for locating your position on the map, #2 is for marking a waypoint, #3 is for recording a track, and #4 is for taking a photo. When opening Gaia, my first step is to locate my position on the map. Doing this is simple - just click the circle to the right of the #1 in the screenshot. Gaia has some additional options for this function but this selection will get you started. To add a waypoint, click the circle with the plus (+) inside, which is shown to the right of #2 in the screenshot. This will open up a screen (shown below) with a lot of options: record a track, add a waypoint (which you use if you want to manually enter coordinates), add waypoint (my location), create route, create area, download maps, and take picture. To add a waypoint for where you are located, select "Add Waypoint (My Location)." This will open up a screen that will allow you to enter a title and customize the icon. Now, your waypoint will appear on the map and be added to the waypoints section in the "Saved" folder in Gaia (see the bottom of the Gaia home screen for the "Saved" folder). This feature is one that makes Gaia incredibly useful for scouting and record-keeping for your photography. When you click on the camera icon, your phone's camera will open up and you can take a photo. After you take the photo and save it, the photo will be added to the map as a waypoint. The photo will also be saved in the "Saved" folder (see the bottom of the Gaia home screen) as a waypoint with a photo attached. You can edit the title of a photo, add it to a parent folder for better organization, and add notes. If you do not have the camera icon on your Gaia home screen, you can also click the circle icon labeled as #2 and then select "Take Picture." We use this function to take photos of all sorts of things - trail signs at junctions, the back of our LCDs to document composition ideas, viewpoints than might make for interesting photos under different conditions, and interesting smaller subjects. These photos help create a repository of information that is helpful for hiking, navigation, and photography. I record a track when I am out hiking because I like to know how far I traveled and to have the information saved for future reference. For example, during our recent Death Valley trip, it was helpful to look at a recorded track to know how long it would take to hike to a location for sunrise. I have also used a recorded track to re-locate a spot that I forgot to mark as a waypoint but wanted to return to again for photography. To start recording a track, you can click "record" if you have that option on your home screen (#3 in the photo) or you can click the circle icon next to #2 and select "Record a Track." After you click "record," Gaia will track your distance, ascent, descent, and a lot of other helpful information. When you are done with your outing, click the same button to "Finish Track." After finishing your track, you can save a title and change the track's color. The track will now be saved in the tracks folder within Gaia's "Saved" section and you can access all of the helpful information that Gaia recorded. (Note: if you forget to finish your track and drive off, you can go back in Gaia and crop the track; the Gaia website has information about this function). Do note that recording a track can use up a lot of battery, which can be an issue for a multi-day trip. We typically record tracks for full-day hikes. For reference, recording a track, marking waypoints, and taking photos using the Gaia app during a full-day hike usually uses about 30 to 40% of an iPhone 7 Plus battery when the phone is kept in airplane mode. Gaia screenshots, from left. #1: this screen opens when clicking the circle icon with the plus sign inside (#2 in the first screenshot above), #2: this screen shows a saved waypoint with a photo, and #3 shows a saved track. In an area as large as Badwater Basin in Death Valley National Park, saving this kind of information can make it much easier to return to a specific composition at a later date. Click the file to see a larger version. These screenshots show the basic process of importing a GPX file into Gaia. Go to the Golden Canyon hiking page on the Death Valley NP website and scroll down to the GPS Data section. Click on GPX File (circled in pink). If you have an iPhone, this will open the screen you see in Step Two. Now, you will need to open the GPX file in Gaia. If you only have one GPS app on your phone, the first option will likely be "Open in Gaia." If you have more than one GPS app, you may need to select "More." Selecting "More" opens the screen you see in Step Three. Here, you can choose to copy the file to Gaia (circled in pink). The Golden Canyon-Red Cathedral track should now appear in your folders in Gaia. From here, you can view the track on a map, see the distance, and other trail data. Assuming you have downloaded a detailed map in advance, you can now use this information to navigate during a hike, adding your own waypoints and photos as you go. You can follow this basic process to import information into the Gaia app, which can be helpful with trip planning. The Gaia app is used by people around the world for all kinds of trips, from a short afternoon day hike to much more complex, multi-day expeditions. While the features I covered above will get you started using the app, Gaia's help center and resources created by other users can help you learn how to use the app to its full potential. If you use Gaia and have any additional tips, please share them in the comments. Also, if you found this post to be helpful, please let us know. Your feedback helps us know what kind of information we should share with our readers in the future. Thanks!